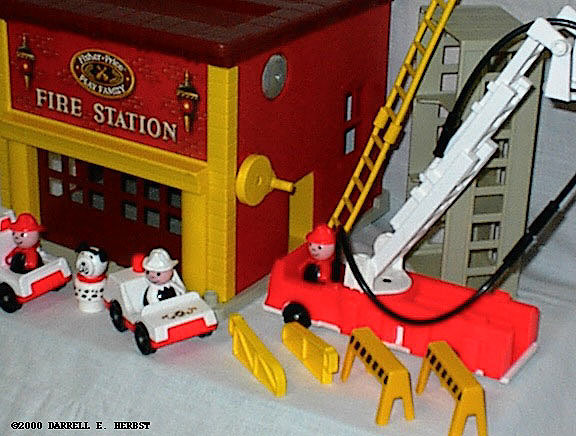 Description: For nearly two decades, the Little People line had always had one fire truck or another, but they never had a firestation....until the #928 came along. The accessories were mainly exclusives with few variations existing among them. 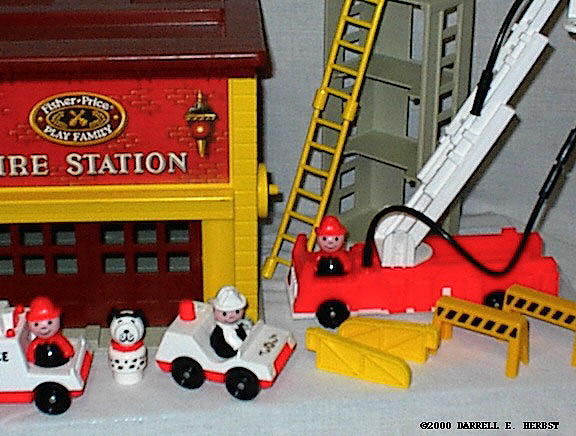 To make up for the lack of variations, the Fire Station is filled almost entirely of easily lost, hard-to-find pieces, much like the #945 Offshore Cargo Base and Lift & Load sets were. The firehoses are probably the rarest of the bunch with the fire truck stabilizers in close running. The stabilizers were also sold with the #346 Fire Engine Rig, which stayed in production until 1990. Nevertheless, the stabilizers are such oddly-shaped pieces that most children never found a use for them and soon threw them into the trash. 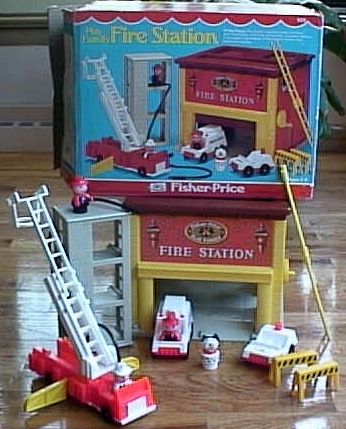 Lucky is the collector who manages to get both the fire hoses, both the ladder pieces, both the stabilizers, and all of the other hard-to-find piece that it takes to complete this short-lived set. 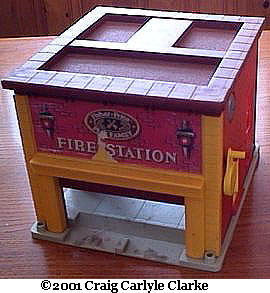 B928A - Firestation Base - Red brick-simulated fire station with a grey plastic base, a brown roof, 2 yellow columns on the front corners, a large yellow frame around the front fire truck door, and a litho above the fire truck door marked "Fisher-Price Play Family FIRE STATION". A yellow hand crank on the side of the building makes the brown fire truck door on the front move up while the bell above the crank rings. Measures 10-3/8" square x 8-3/8" tall. FPT936 - Grey simulated brick sided square-base three story practice tower structure that is approx. 10" tall and 3" along each side. Has large and small "windows" up and down each wall. FPT531 - Small white top, red base 1-seat fire chief car. The car has a red knob siren behind the driver's seat and is marked with a gold flower-shaped badge on the hood with gold "scrolls" on each side. The car has a gas hole beside the siren and it rolls on 4 black plastic wheels held on via metal rivets. The wheels are marked "Fisher-Price Toys". See "Variations" below. FPT810 - Red top, white bottom fire truck with a white ladder base in the center. The ladder base swivels and holds the 3-piece ladder extension (SEPERATE PIECES). The fire truck has NO DESIGN on the cab door. NOT marked on the bottom. FPT717 - 2 each - Yellow hard plastic vehicle support/stabilizer. The stabilizer is almost rectangular (one corner rounded). The stabilizer serves as the anti-tip-over devices for the long plastic firetrucks. FPT718 - Black rubber hose with a plug on one end that attaches to the fire truck, and a connector plug with a male peg on the opposite end. FPT1201 - Black rubber hose with a plug on one end that attaches to the fire truck, and a water nozzle on the opposite end. The nozzle does not taper on the end. 2 each - FPT254 - Yellow 7-rung ladder with round connector on the end to link the two ladders together. 2 each - FPT231 - Yellow plastic road barricade that is shaped like a sawhorse. The barricade has triangular support legs on the ends that connects a yellow rectangular bar together on top. The bar has black warning stripes on sides and the top of the bar is textured. 2 each - FPP - Black body firemen with red fireman helmets and red hands. IPP - Black body fireman with a white hat and hands. IAPP - White dalmation dog with a red collar. The collar has lines on the outside edges. *See Variations below. FPT532 - Small white top, red base 1-seat fire chief car. The car has a red knob siren behind the driver's seat and is marked with a gold flower-shaped badge on the hood with gold "scrolls" on each side. The car has a gas hole beside the siren and it rolls on 4 black plastic wheels held on via metal rivets. The wheels are NOT marked "Fisher-Price Toys". MBPP - The dalmation dog has also been seen with a yellow collar opposed to red.